"FIRE NIGHT" is a time of Invading earth with Heaven through praise and worship! All believers are encouraged to join us to worship and interceed for our community and nation in this first of special services. Join us on October 31, 2018, at 7:00 pm. It is time the Church took our place in the earth! 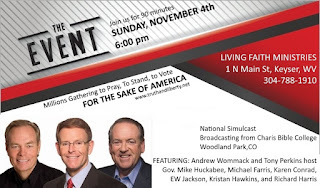 Living Faith Ministries is hosting a live simulcast of "THE EVENT" on Sunday, November 4th, 2018, at 6:00 pm at 1 N main Street, Keyser, WV. THE EVENT is hosted by Andrew Wommack and Tony Perkins, with Gove. Mike Huckabee, Michael Farris, Karen Conrad, EW Jackson, Kristen Hawkins, and Richard Harris. This COMMUNITY EVENT isopen for all to attend. Come and prepare for the 2018 mid-term elections with us. For more info call 304-788-1910.